Los Angeles is full of talented moms. Some have been successful in Hollywood, others are excellent at raising children on their own and managing a home and others channel their free time toward their creative and artistic ambitions. 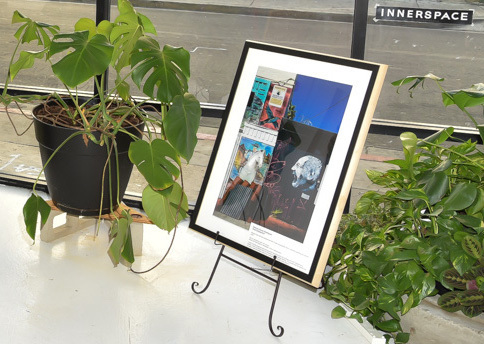 For the Mommy In Los Angeles® Magazine print launch party, our artwork organizer and curator, Nancy Lozano-Stecyk recruited a group of incredibly talented artists, most of whom are local moms, who willingly exhibited their artwork at InnerSpace Gallery. Art mediums ranged from ink prints, to balloon installations, color pencil sketches, oil on canvas, photography, textiles and even miniature furniture designs. 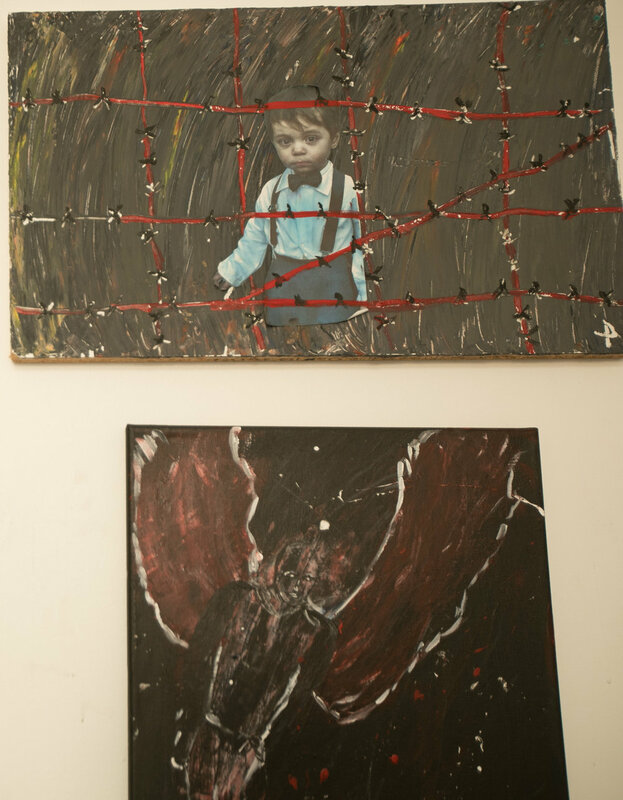 Not all artists' work is represented below, however, please contact us at: info@MommyInLosAngeles.com if you captured photos of artwork not shown. A mother is birthing her second child. She takes in the moment with both an unfamiliar, yet nostalgic lens, as she is allowed to have the space to listen to her body. Each time a mother gives birth, she is giving birth to a new part of herself. She either invites or lets go of experiences that will gently lead how this journey as a mother will look in this season of her life. 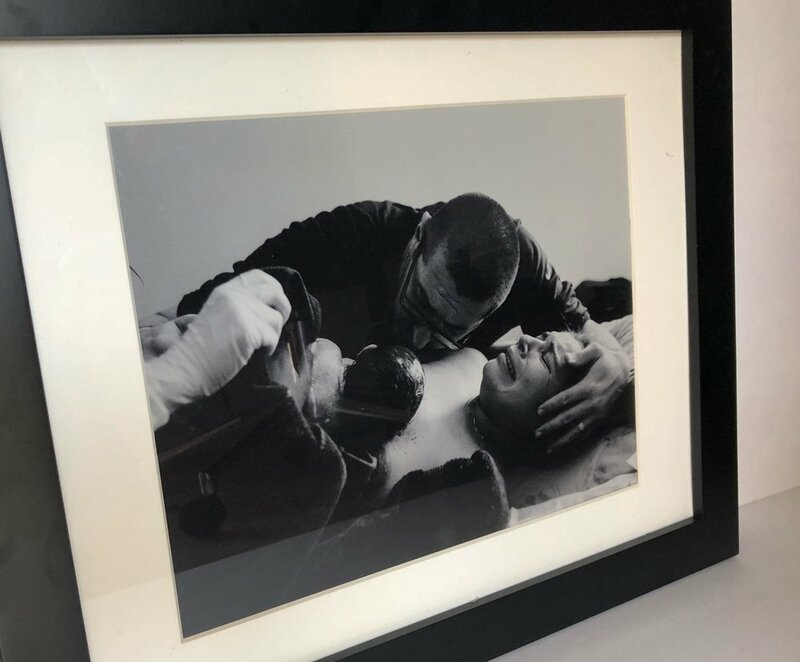 As Carolina was taking this photograph, she says: "I felt the mother’s energy at its most powerful and vulnerable state, a moment of in between worlds." Self-funded for over ten years, Real Mother is a personal project Alyson Aliano started photographing when her twins, Hallie and Ellison, were 9 years old. When the twin girls were five, Alyson married their father, instantly becoming a parent at age 26. “I then began photographing any mother that would let me, anyone that would share their story, their experiences, anything,” says Alyson. Since that time, Alyson divorced their father. The twins’ biological mother and Alyson became friends and raised the girls together. The girls are 22 now. This was Dani's first statement piece. The neon artist says she was turning 25 and felt like she hadn't done something "monumental". She wanted to make something large and true to prove herself as an artist. "Because cats have always been of huge symbolism to my life, I have such a deep, deep love for them, it felt right to make it that big in Pink neon," she says. Dani also designed the #LAMomsRock neon sign at the magazine launch party. When Crystal was 19 years old, she was filled with emotions of Envy, Greed and Rage. She had to hide most of them during that time because she felt society wanted to break her. At the same time, she was working on her temper and her personal rage which was "let out" through this collection. The canvas became her "safe place'. The colors were inspired by Hawaii, where she was living at the time. Because her home was paradise she felt she always had to force a smile, even when she was suffering on the inside. All three paintings have the color yellow as the "Sun,” a glowing light to follow through the darkness and guide people back to being their beautiful and colorful selves later. The paintings were also inspired by the Japanese saying "You have three faces. The first face, (Rage), you show to the world. The second face, (Envy), you show to your close friends, and your family. The third face, (Greed), you never show anyone." Inspired by her own self-love journey and learning to love her own body, Crystal painted this beautiful Golden Goddess, who is pushing down the darkness and fighting off the negative stories she has told herself about her own body and self-worth. As she pushes away the negativity she’s allowing for the beautiful vibrant positivity to embrace her and remind her how beautiful and valuable she really is. This painting is the first in a series of body positive paintings Crystal is currently working on. 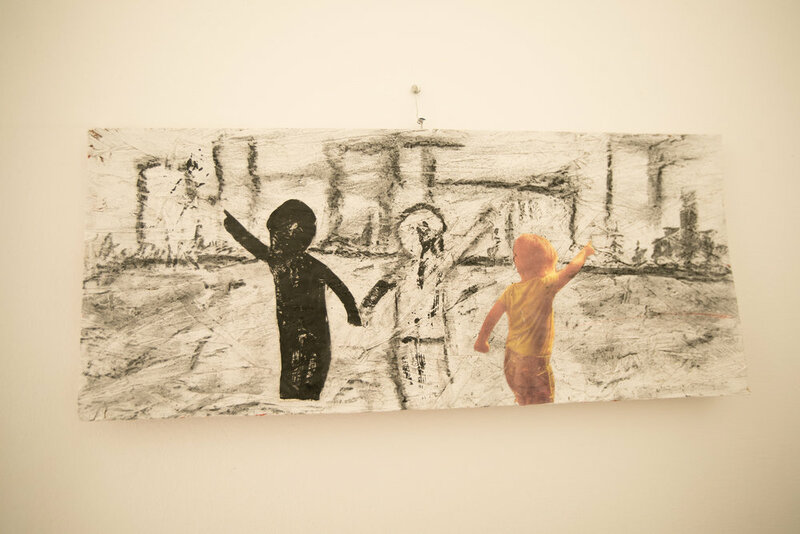 When Donald Trump was elected to the presidency in 2016, the artist was inspired to create a piece that depicted a world ruined by adults through the eyes of a child. The artist originally intended to draw a matador holding up a muleta in anticipation of the "elegant" bullfight killing, but as Paul continued adding layers of color, he dropped the matador's muleta, transformed his cape into angel wings and painted the hands in his pockets, converting the colorfully dressed matador into a dark angel. The idea being, that even when your conscience tells you something is wrong, a second attempt at making things better may not work either. Desiree was 7 months pregnant and craving inspiration that had nothing to do with pregnancy or babies. "I took my camera down to Silverlake and just started walking," she shares. "The scene was too colorful not to notice. I see the stories it tells, and I wanted to remember and honor it." 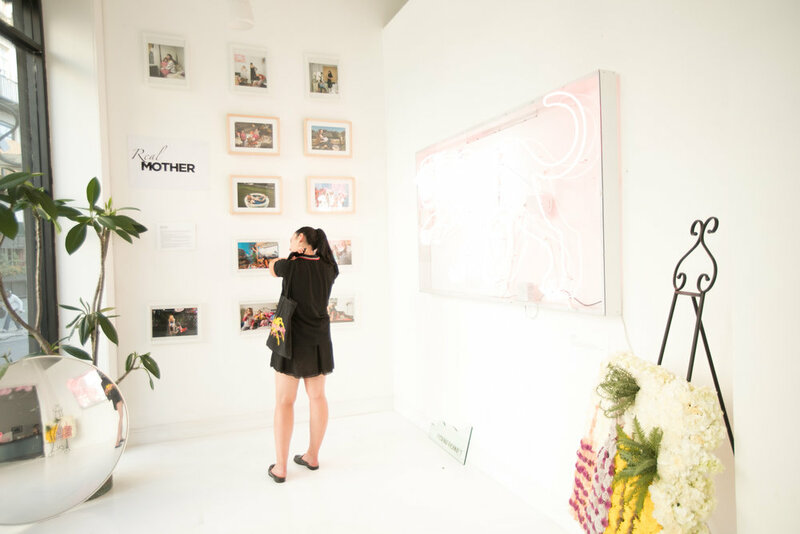 Using a variety of elements, Connie used her knowledge and experience in flower design to recreate the Mommy In Los Angeles® Magazine logo as a display piece for the art exhibit aspect of the magazine launch party. Her design consisted of carnations, daisies, roses, Scabiosa pods (for the palm tree trunks) placed on a 3' x 3' wooden board that weighed about 60 lbs. "I love to see people smile. It makes me happy," says Connie. "My love for flowers runs in my blood!" Maryi is married to the photographer's uncle. They visited from Colombia for the first time, and probably their last, to join Daniela as she married the love of her life. Their visit was extra special for Daniela because – since it was her second marriage – most of her family felt like it wasn’t worth taking seriously. But they did. Maryi got her hair done in Daniela's room. "She looked beautiful, so I had to pause the wedding prep to photograph her for a few minutes," says Daniela. "This was her first photo shoot ever and it was with me, on the day of my wedding. How beautiful." The photographer met Reina, the mother of these twins, during the Happy Mom Conference. She was eight month pregnant at that time and stood up during an information session to ask for guidance on how to use her breath to find peace at home with twins, a daughter, a second set of twins on the way, and a tight budget. "She touched so many of us," says Daniela. "I felt inspired to ask her if I and my photography could be of any service to her." New Mama Olivia Cullen two weeks postpartum with Baby Levi. Daniela says: "So much of the pleasure of motherhood happens in retrospect. When the kids are asleep and the chaos subsides and we can just enjoy their sweet faces. This is why I love motherhood photography. I know being a mother feels messy most days, but holy cow does it look beautiful in photos. And to be able to look back and see that beauty, maybe for the first time, means everything to me." Rebecca’s Journey of a Thousand Lands collection is composed of a series of imagined landscapes that have evolved during her experiments with alcohol inks this year. 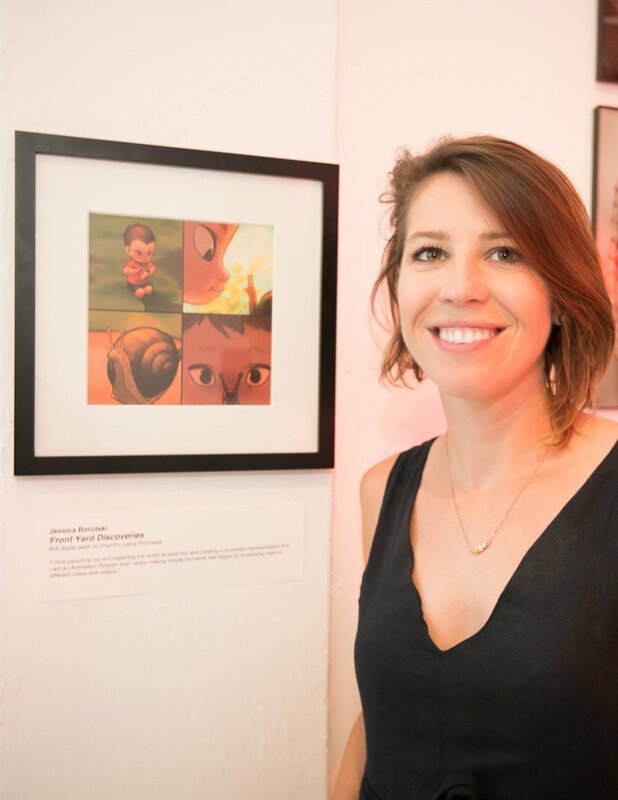 In addition to being representational of her journey through Motherhood, she chose this collection for this exhibit citing many similarities between her parenting style and working with this medium. “After struggling through a bit of a speech delay last year, my daughter was diagnosed on the autism spectrum in the fall. This whole experience has led me to truly learn to let go of expectations and to understand that not everything in life is going to go according to your plan,” she says. "Growing up art was a life saver. It provided me an outlet to express myself during different phases of my life. I now use my artistic skills to give back to my community, through my work with children in therapy, working with parents, arts education and community beautification." Inspired by special moments in motherhood. Every time my children give me flowers i draw a picture of it. We then donate the pieces to a children's art program in our community which sells the pieces to continue funding art programs for kids. Their gift to me becomes a gift to others. Parenthood can bring so many emotions. It can be scary and beautiful. No matter what, we are the solid branches that enable our young ones to grow. This piece was inspired by my daughter Hailey and a group of senior citizen women/moms. For a year, every Friday evening, my daughter and i spent time drawing and painting with a group of senior citizens. These awesome ladies shared their stories and gave me lots of advice regarding parenting. They taught me to slow down, be patient and enjoy the little moments with my daughter. 8x10 Watercolor on Rice Paper. This painting is inspired by road trips taken with my kids. The beauty and chaos of traveling with children is worth it. Being outdoors and exploring nature as a family helps us all rediscover each other, bond and grow. It also grounds us and teaches our children to love planet earth. This piece is inspired by the beautiful country side of Alberta Canada. It is dedicated to my father in law who was a farmer and taught his sons the value of responsibility, hard work and spending quality time with family. This drawing and short passage were created as a part of my clothing line that focuses on inspiring children to advocate for compassion toward animals as they grow. Brandy believes inspiring children is our best chance at creating a world where all souls live harmoniously together. Growing up, Isabel's parents owned a party hall that was rented frequently for a wide range of celebrations. She remembers helping her parents prepare for parties, which often times involved decorating with balloons. Little did she imagine, however, that she would end up doing the same as a mompreneur with her very own balloon business. As the owner of Balloon Babes, Isabel offers a range of mylar balloons which she designs to highlight her Mexican culture and to empower and uplift a celebration. Using some of her line's You Make Momma Proud balloons, she decorated a cardboard frame that welcomed guests to Innerspace Gallery. This painting was a gift to my mother honoring her and my grandmothers and the many trees they've planted and cared for in our family. What describes a woman's sensuality? Is it the dress that accentuates her curves? Is it her delicately scented perfume? As women, we have an innate gift of flirtatiousness, playfulness and softness. You may have lost touch with them but they are within you. Re-connect with your feminine spirit. Remember, you're a radiant, magnificent, valuable and splendid jewel! Louise considers Growth and Protection, the two jobs of parents. Her piece is related to the core of womanhood whence all babies stem. Currently, the artist is creating her own textile art prints and collections for fashion and the home under the label LOUIS JANE™. A graduate of the Fashion Institute of Design and Merchandising in Textile Design as well as graduate of the UCLA Anderson School MBA program and the California Institute of Technology, with a BS in Astronomy, Louise has been a successful entrepreneur who has created consumer products, and innovated technology solutions that make our lives easier. 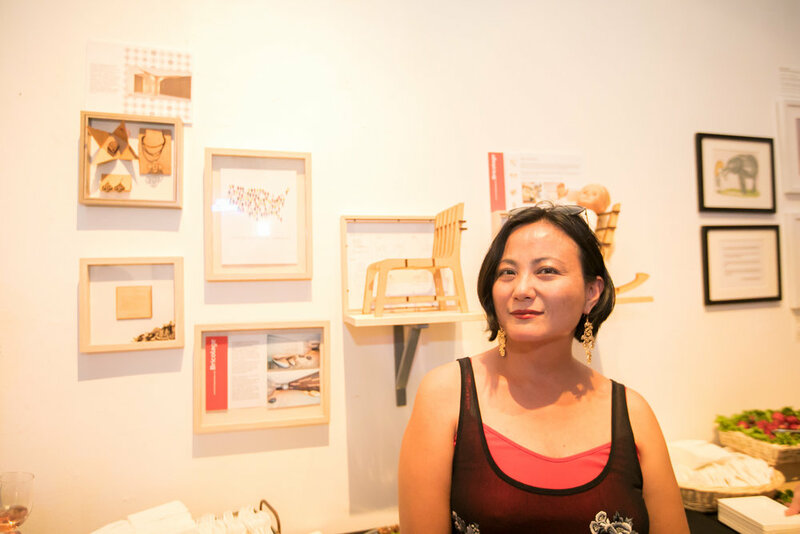 She is also co- founder of Surrogate Gallery Projects with Holly Boruck. As a child, I always built furniture and clothing for my dolls, because I could not find the ones I liked. It was probably the beginning of my passion for art and design. When my son was in 3rd grade while I was teaching 'Design Thinking' to his classmates, it became clear to me that I'm not the only girl who loves both playing with dolls and building. Bricolage's Do-It-Yourself doll furniture line comes packaged in a flat box, with an instruction and a photo of the finished furniture. The girls (and boys) can put it together easily and decorate for the 18" dolls. All furniture is designed with forward-looking design aesthetics.